Travel writing is arguably the most persistent of all literary genres and is found in numerous cultures across the world. How do we define travel narratives? What kinds of real or imaginary geographies do travelers chart? How are travel narratives affected by encounters with cultural others and by ideologies of colonialism? Do male and female travelers see the world differently and does that difference mark their texts? To answer these questions we will study literary texts from the medieval period to the present as well as films including The Voyages and Travailes of Sir John Mandeville Knight, Our Sister Killjoy by Ama Ata Aidoo, Chris Marker’s essay film Sans Soleil,Amitav Ghosh’s In an Antique Land and selections from the New Granta Book of Travel. 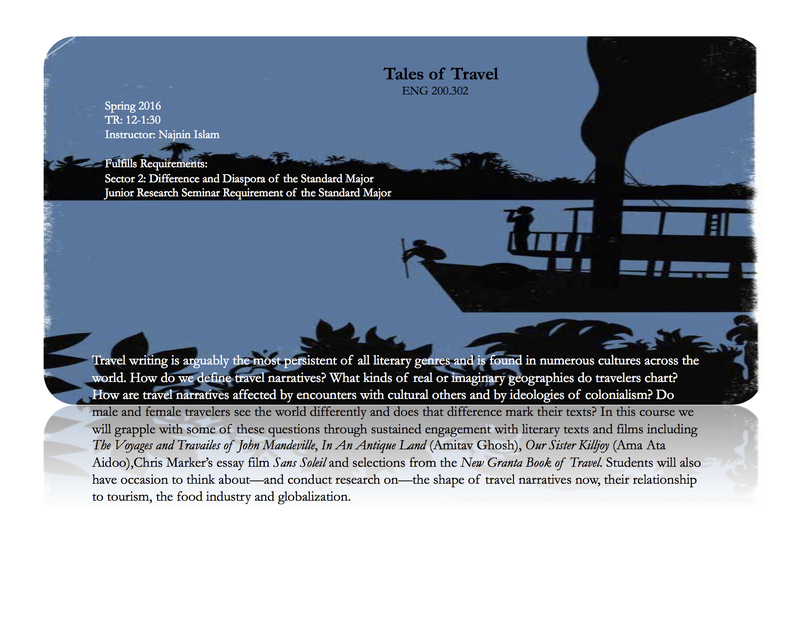 Students will have occasion to think about--and conduct research on—the shape of travel narratives now, their relationship to tourism, the food industry and globalization.